← Gather your gal pals for ‘It’s a Girl Thing’ this September! 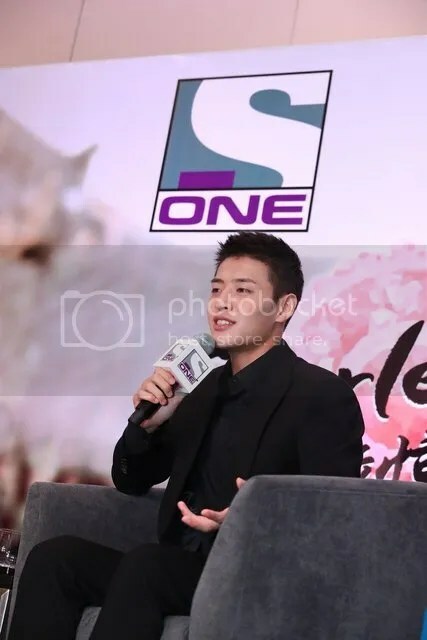 On August 26, the star of upcoming mega-hit sageuk drama Scarlet Heart, Kang Ha Neul met with the media for an exclusive press conference at The Westin. Decked in a black suit, the 26-year old rising actor charmed the media with his winning smile and trademark V pose and later, shared his thoughts on his latest project and his acting career. Kang is in Singapore to promote his drama, Scarlet Heart and this marks his second visit. Helmed by a star-studded cast, Scarlet Heart is a Korean remake of the Chinese hit series (步步惊心) and is based on the Korean Goryeo dynasty instead of the Chinese Qing Dynasty. The South Korean adaptation is led by prominent director Kim Gyu Tae, whose past works include acclaimed series That Winter, the Wind Blows. Kang plays the role of the dashing 8th Prince, Wang Uk. Due to the immense popularity of the original series, high expectations were set for the drama production. However, that did not stop the actor from participating and instead, Kang decided to view it as an opportunity to challenge himself and grow as an actor. He shared, “I knew of the popularity of the original Chinese drama even before the remake was announced. But at the end of the day, I decided to give it a go and enjoy myself as much as I can because that will bring out the best in me as an actor for my role in the drama”. Kang shared that he loves how his role had a growth element to it, which later accelerated after crossing paths with Haesoo (Lee Ji Eun aka IU). Kang also added that he was able to enjoy the whole filming production with a strong support team consisting of his fellow cast and production team. He assured that viewers can look forward to watch a drama that is both aesthetic and interesting. The actor shared the filming team paid a lot of attention onto the aesthetics (angles shots, colors in a frame etc). Also, good news for fans of Kang Ha Neul. It seems that the actor will not be having any kiss scenes in the drama! Popularity of Sageuk dramas has been on a rise and Kang believed that this could be due to the “fantasy + history” combination. He shared, “A lot of elements in Sageuk are something that we cannot relate fully because we have never lived in that era before. Something that they cannot relate to in real life but also provokes your imagination. I think this appeals to them”. In contrast to the studious and skillful fighter his on-screen character portrays, he shared that he is a totally different person off-screen. Simply, just another boy next door. Humble, indeed! When asked what roles he would like to try in the future, he expressed his interest to play the role of a young father. Also, if given a choice to go back in time or see the future, he replied, “Travel back in time. What is going to happen in the future is decided by my present. So, I still have the power to make my future different. I would rather travel back in time and make the correct decision that will affect my future which is the current present”. Wise. Scarlet Heart premieres on 29 August at the same time as Korea, every Monday and Tuesday at 9pm, first and exclusively on ONE. ONE is available in Singapore through Singtel TV Ch 513 & 604 and StarHub TV Ch 124, 820 & 823. Be sure to catch the star himself at Village Square @ Level 1 at Waterway Point for a public meet & greet! The event will commence on Saturday (27 Aug), 5:45PM.